BMW made its mark in the U.S. market years ago with the likes of the BMW 2002, a compact sporty handling car that could run circles, or ovals, or whatever shape you wanted, around most other cars. It was quick and lithe and fun to drive. But as all cars, BMWs included, have grown in dimensions, especially weight and length, many Bimmer fans have bemoaned the Bavarian firm’s stray from the small coupe market. Some of us also wish there were still an “Ultimate Driving Machine” that a few more of us could afford. 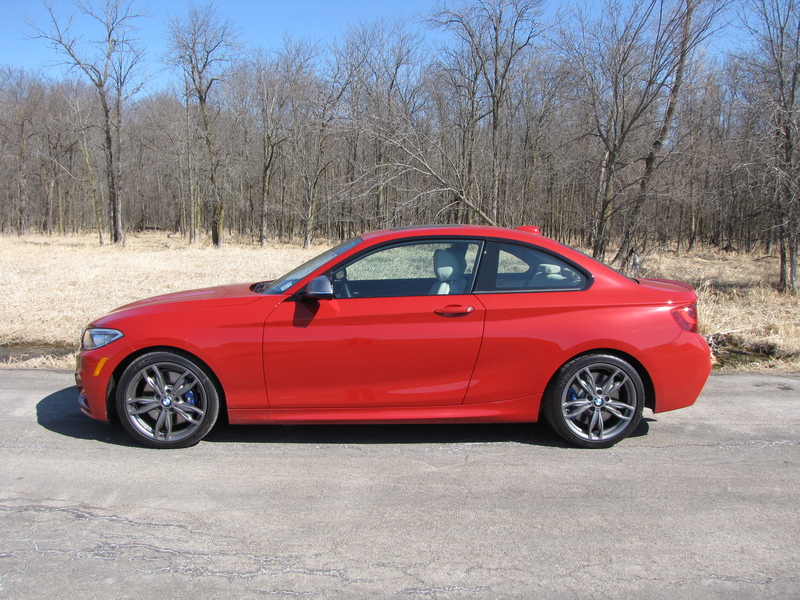 Well, BMW nails, or should we say re-nails, the lithe fun sports coupe with its 2 Series. A base 228i with 240-horsepower and a manual transmission now comes in at $33,050 including delivery, so in line with an average car’s cost. I’d love to drive one in that trim. Yet this week I was granted an audience with the M235i xDrive, which takes the 2 Series to its raciest extreme. The M with xDrive drops a 320-horse twin-turbo I6 into the smallest BMW coupe with terrific results. That twin-turbo pumps out a delicious 330 ft.lbs. of torque and turns the 2 Series into a street legal racer. Slap down the throttle and the M235i pushes you back in the seat and you hold on to the thick leather-wrapped steering wheel praying there are lot of winding roads just over the horizon. The car’s steering is moderately heavy, but extremely precise, exactly what you’d expect from a BMW. Yet the coupe doesn’t feel heavy, tipping the scales at just 3,695 lbs.